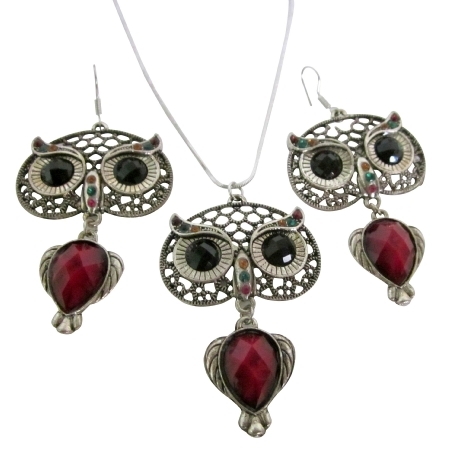 Beautiful vintage oxidized owl jewelry with ruby enamel body and glowing black eyes. If you are looking for something unique, you are sure to like this. The owl bird has been known in human culture to symbolize intelligence & mystery. It was a symbol for the goddess Athena daughter of Zeus & denoted prosperity & fortune. In many cultures around the world, the owl is seen as a symbol of wisdom. This item in Traditional Necklace Sets category was first added to our catalog on 12-08-2013. Buy Owl Nocturnal Bird Glowing Eyes Ruby Pendant Earrings Jewelry, sold & shipped by Fashion Jewelry For Everyone where you can shop online for Leading Online Retailer for Indian Fashion Jewelry. This Necklace Sets collection has been tagged as valentine gift, oxidised, holiday gift, stylish cool prom jewelry, bridesmaids, gift set, fashion jewelry.